The What: Extron Electronics has introduced the DMP 128 Plus Series, the latest generation of Digital Matrix Processors featuring Extron ProDSP 64-bit floating point technology. The What Else: DMP 128 Plus Series processors are equipped with 12 analog mic/line inputs, eight analog outputs, up to four channels of digital audio input and output via USB, up to eight audio file players, and new configurable multi-device macros. An ACP bus makes it easy to connect one or more ACP Series audio control panels, offering an economical solution for audio system control. DMP 128 Plus V models also include eight independent channels of VoIP, supporting Session Initiation Protocol—SIP 2.0. The DMP 128 Plus AT models also provide Dante audio networking technology with connectivity for up to 48 digital audio inputs and 24 digital audio outputs. Configurable using Extron DSP Configurator software, the DMP 128 Plus Series processors feature an expanded mix matrix, up to 84x48. 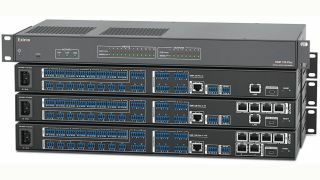 DMP 128 Plus Series processors can be used anywhere from a credenza-based system to a large multi-rack system, and even in a large, complex, decentralized multi-building system. The DMP 128 Plus C, DMP 128 Plus C AT, DMP 128 Plus C V, and DMP 128 Plus C V AT models include Extron AEC for conferencing applications. AEC facilitates effective remote room-to-room conversations, ensuring clear, natural communication for all participants. These models include eight independent channels of high performance AEC, as well as selectable noise cancellation. Typical AEC processing can be challenged by conditions such as double-talk, when talkers from both ends are speaking simultaneously, and when near end talkers use wireless microphones. Extron AEC features algorithms that deliver fast echo canceler convergence for optimal intelligibility, even in challenging conditions. The Bottom Line: DMP 128 Plus AT models are equipped with Dante audio networking technology and provide scalable audio transport over a local area network using standard internet protocols. Each DMP 128 Plus AT sends out 24 channels of digital audio and can receive 48 channels over the network. Dante technology can support up to 512x512 audio channels at 24-bit/48 kHz over a single Gigabit ethernet link, or 48x48 audio channels at 24-bit/48 kHz over a single 100 Mbps ethernet link with extremely low latency. Additionally, the DMP 128 Plus AT can be configured to support primary and redundant Dante audio networks.